Governor Terry Branstad’s newest proposal to expand high-speed Internet access resembles last year’s proposal, but it also has important differences. The new bill attempts to incentivize broadband expansion in areas of Iowa where Internet speeds are below 25 megabits per second of download speed and three megabits per second of upload speed. Under the bill, an Internet provider could apply to the state’s chief information officer for a grant and a three-year property tax exemption for their new investments in underserved areas of Iowa. It also would require local governments to either approve or deny applications for broadband infrastructure within 60 days of their submission. Unlike last year’s proposal, this year’s “Connect Every Acre” proposal does not include a process for private companies to lease bandwidth from the Iowa Communications Network (ICN). It also does not include provisions governing the siting of cellular towers, another contentious issue from last year. The House Commerce Committee is considering the legislation and hearing from stakeholders. Tuesday’s meeting featured representatives from Mediacom, Century Link and a small Iowa communications company. A subcommittee of three Republicans– Representatives Peter Cownie, Tom Sands and Chuck Soderberg–and two Democrats will closely consider the bill this week as they gather further input from stakeholders and the public. The Military Homeownership Assistance Program is now in its tenth year and is still going strong. The program provides down payment assistance to military service members and veterans purchasing homes in Iowa. The goal of the program has been to help these heroes make their permanent home in Iowa by providing a $5,000 grant to help with the down payment and closing costs associated with such a large and important purchase. The program is a joint effort of the Iowa Finance Authority and the Iowa Department of Veterans Affairs and is funded through an appropriation by the Legislature. Since the program’s inception in 2005, the program has funded more than $15.4 million in homeownership grants to 3,244 military service members, veterans, and their families. All funds are granted out on a first come first serve basis and are subject to the state appropriating money to the fund. In fiscal year 2014, the Military Homeownership Assistance Program aided 423 service members and veterans in achieving homeownership. More information about the Military Homeownership Assistance Program and the application is available at IowaFinanceAuthority.gov. On Tuesday, the American Heart Association announced a $4.6 million grant that will launch a program called Mission: Lifeline Iowa. The goal of this project is for all Iowans to receive the same quality of care, whether they are living in rural Iowa or a metro area. The mission of the program is to improve the system of care for people in rural Iowa that have serious heart attacks. According to the American Heart Association website, more than 250,000 Americans experience a STEMI (ST Segment Elevation Myocardial Infarction) heart attack each year. Many of these patients fail to receive the appropriate treatment for their condition within the recommended timeline. These types of heart attacks carry a substantial risk of death and therefore require a quick response from medical personnel. The Mission: Lifeline grant will utilize heart monitors that will help providers determine where the damage is happening within the heart. The monitor sends information to the hospital, where heart specialists can analyze the data while the patient is transported to the hospital. The grant also provides funds to educate the public. It is better to call 911 during signs of a heart attack and not drive the person to the hospital yourself. 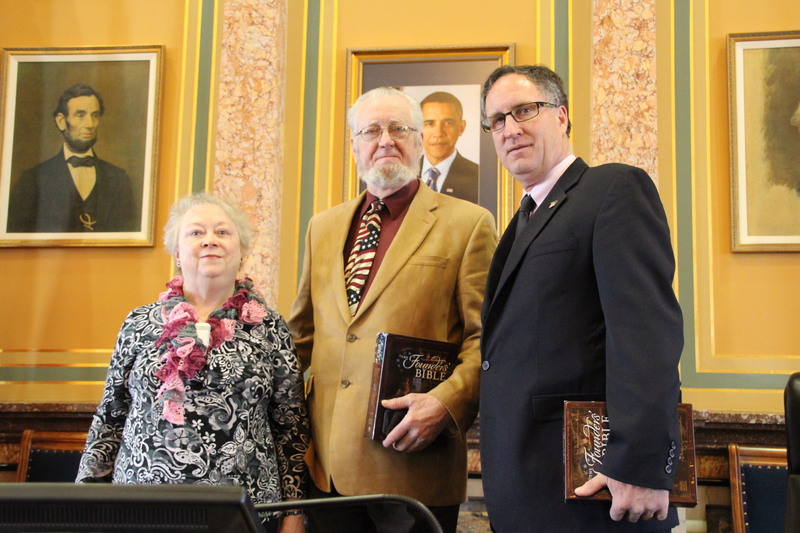 Pastor Merlyn Farrand visited the Capitol this week. He is the pastor of New Life Assembly Church in Manchester. Other clergy from around the state joined Pastor Farrand as they spent the day meeting with legislators. The Pastor presented me with a Founders Bible. Each legislator received one. It is nice leather bound book with the legislator’s name engraved on the cover. I want to thank Pastor Farrand for the generous gift. This week was also filled with committee meetings. Committees are finally starting to discuss and pump out bills to be debated on the floor. A couple of bills considering the Gas Tax are being looked at. Leadership of all four caucuses in the House and Senate have held meetings with the Governor to find common ground. The bill is currently being drafted and will move to committee in the coming weeks. There is a lot of discussion on the items to be included in the bill. The bill will raise the user fee on all fuel by 10 cents. There is a biodiesel component that provides a kick back for B10 and over. County bonding will be restricted to some degree under the bill. It will still be allowed, but in a limited form. Another significant program in the bill is Access Iowa. It prioritizes certain roadways and highways that need repaired. There still is a lot of work to be done but things are on the move. Wednesday the Iowa Motor Truck Association was in the Capitol to talk to legislators. They had 15 semis at the Capitol. Legislators were given rides around Des Moines. They explained where blind spots are and other issues such distracted drivers that truckers face every day. Thursday morning General Orr of the Iowa National Guard gave his speech on the condition of the Guard. We can be proud of our guard and the service they have provided when called to duty. My thanks go out to all those who serve in the Nation Guard. If you have any questions, comments or concerns about these topics or any others please feel free to contact me by e-mail at lee.hein@legis.state.ia.us or by phone at (515) 281-7330.